Every portion of 1973 has its own special flair or flavor. 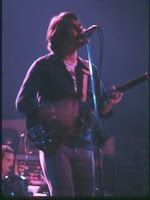 The band’s improvisational groove was evolving on a tour by tour basis, and there were strong themes to each stage of the year. 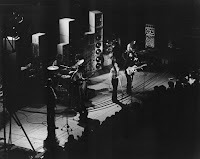 If I wasn’t such a diehard fan of the jazzy/spacey jamming nature of the Summer ’73 shows in particular, I would absolutely hold March 1973 above all else from the year. The March shows have a special trademark. Over and over again the band finds its way into a jamming passages that defy naming. Set lists almost don’t do it justice. There are more times where you can only call something a “jam” in March ’73 than most any other stretch of the year. The band was pushing its own envelop to extreme in March. Also, there is hardly a weak moment in the entire tour. Every show, with the possible exception of 3/30/73, is top shelf. This makes it all the more difficult to know where to get started with March ’73. For me, when I mentally look at my wall of shows to pick a place to start with March 1973, I land on 3/26/73. So tough is this decision, that just typing the date out into this post fills me with regret and indecision. I’ll take that as a reminder that the entire month is filled with must-listen-to moments, more so than the possibility that it’s the wrong choice. Take this as an opening door. You can safely step back into the hall of March ’73 and open most any other. The entire month is blessed with A quality soundboard recordings in circulation. This was not always the case, mind you, and 3/26 was one of the late comers to the SBD circulating pile. This never stopped it from going down in tape collectors' minds as an amazing show worth checking out. 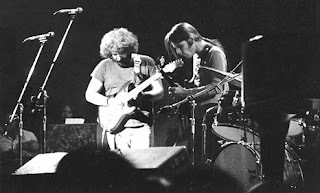 In a perfect example of how March ’73 found the band going down completely uncharted paths, the 3/26 Truckin’ slowly dissolves into a shimmering pool of light ripples and waves, drawing to a near stop, then meandering again like soft footprints in delicate sands. While the logical transition from this song would be into Other One, here they have gone in a completely different direction, luxuriously sliding into a Weather Report Suite Prelude. This is one of the early handful of times they played it (it wouldn’t get into regular rotation until September ’73 after they recorded the Wake Of The Flood album), and it fits perfectly. This then opens up into some of the prettiest free form jamming of the entire year. It is Dark Star-esque in the way it simply seems to expand in all directions. Billy picks things up with a light jazz tempo, and the band follows him on a beautiful stroll for a time. Jerry starts hinting at slightly darker themes, but the lovely nature of this “out of bounds” jam can’t be turned off track. We eventually emerge into Wharf Rat. It fits so well, it’s as if it was planned all along. Wharf Rat masterfully spirals out into Me & Bobby McGee. Jerry solos over the entire song beautifully; his lines full of grace and subtlety. The song draws to a natural end. The band and crowd take a breath, and before exhaling, Jerry opens them up into a lovely early Eyes Of The World. The tempo is perfect, and a joyous dance ensues. This is one of those close your eyes and rock your head back and forth versions. In less than two months (Eyes debuted in the first show of the year on 2/9/73) this song if fully matured. Jerry’s solos form wide arcs in the sky as he rolls around the guitar neck, and the deep 7/8 jam in the song takes each hairpin turn very nicely. The jam settles itself into Morning Dew, and there’s no place you’d rather be. There are 15 Morning Dew’s in 1973, and they are all worth finding. The band’s slow and silent bloom into the final crescendo after Jerry’s last “Guess it doesn’t matter anyway” will stop your breath and draw all your attention. In the end we get no Other One, and no Dark Star, but it’ no matter. Perhaps even because of this, the show offers other unique and special gifts, going to unexpected places and bringing back treasures all the same. Another treasure worth mentioning in closing from this show is Candyman. There are only 4 versions in all of 1973 and they are stuck in such odd shows that a person might think the song was never even played that year at all. Dig Jerry’s wha-wha infused solo. It’s very nice. Beautiful Box o Rain b/w Row Jimmy in the first set, too. I took my friend Byron to see this, our first ever Dead show, on his birthday. I had been to the Baltimore Civic in the past to see Blind Faith and the Stones in '69. This section of Baltimore was pretty much a war zone back then. When we got out of the car, we asked a local which way to the Civic Center, and he gave us directions and advice that I'll always remember: "Just follow the people with the smiles on their faces". We had seats on the 15th row on the left. First set was awesome. I had the chorus from Half Step in my head for weeks after that. El Paso was a surprise, as I was only familiar with the Marty Robbins version. At the end of the first set, which lasted close to two hours, we picked up our coats and started to head out, thinking the show was over. A guy stopped us and said, "hold on, its just getting started". Truer words were never spoken. Thanks for the great recollection, Patrick. And thanks, Noah, for the reminder about this jam. 3/24 is the one that always pops out in my mind as THE March 73 jam to remember -- though jeez, they're all so good -- but it's high time to pull this one off the shelf (er, harddrive) again. you are my 'scholar' for the Dead. Through you a full world of out-of-body' experience is opening in front of me, an italian who never saw them alive, but is re-living the experience virtually. Now, a request. I am coming from a jazz background and I would like to know which shows in 1973 you would reccomend in that vein. Thanks for all the comments, folks. For our Italian head in search of Jazz-tinged playing, you will find that as my blog grows, this Jazz-Jam-Dead is my favorite over all. I won't spill the beans on all the particular shows that come to mind (gotta keep you coming back to read, right? ), but you will find great pleasure from May through September. Certainly check out 5/26 and anything from June. Also the August 1st show, which I will review here soon. Proceed with caution into the horns shows in September, as you might find yourself wishing they just let Jerry solo more. Mnay thanks for your quick reply. I will contunie coming back to your site, indeed. great review, as always. just wanted to make mention of the "He's Gone" from this show. One of my personal favorites with a beautiful acapella section right near the end of the song. The crowd is eating it up and you can just hear them getting lost in the simplicity of it all. I was just going through the Me & Bobby McGees in my library and came across this show. I can't believe the sound quality of this SBD! Really well balanced all around, with a little more clarity of Jerry's guitar than usual. The sound does tend to get "mashed' (to my ears anyway) or compressed when vocals are present, but any time it's just the instruments, it's easy to forget this isn't some sparkly new, expertly mixed multi-track official release. Like, I dunno, maybe I'm getting a little too hyped, but so many SBDs (esp. from this time) are so bland and flat sounding. I need to spend a day or two with this one. My friends and I drove down from Dallastown, PA to see this show. We were in high school. They lived up to every expectation, but right at the end of the first set, the Baltimore police came through and pulled us out for passing a pipe. They took us down to a room and made us empty our pockets and took our names. I thought my life was over. I was 16 years old. I remember seeing vast tables of contraband. We were simply passing a pipe down the row. They let us go and we saw the full second half. We drove home and I had to stay home from school the next day because I thought my life had just been terminated at the Baltimore Civic Center.